As a new GWTC trade partner, it is with great pleasure that I write the first Dale Drills blog. When offered the opportunity to become involved with the trust we jumped at the chance. Here at Dale Drills we share the same philosophy that good conservation goes hand in hand with economic land use, and it is, we feel, the responsibility of those land users to do all they can to preserve the land for future generations. Edward Dale founded Dale Drills in 1999, when he produced the Zero Till seed drill. Although not necessarily a new concept to the UK, direct drilling is a technique of establishing combinable cereal crops in such a manner that no cultivation is required. Following a period farming in Manitoba Canada, Edward quickly learnt that by changing his outlook and a few simple techniques, establishment costs on his own farm could be greatly reduced. For a number of years farmers on the plains of North America and Canada had been perfecting a method of farming that enabled seed to store contracting rates to be as low as £14 per acre. Whilst some of what he learnt on the other side of the Atlantic may perhaps not have been completely relevant in the UK, at the forefront of his ideas was the concept of direct drilling and how it could be developed for use on the family farm in North Lincolnshire. So was born the John Dale Zero Till Drill. Always a keen engineer Edward designed and built his own machines utilising the Seedhawk tine assembly he had seen work so successfully overseas. Fast forward 15 years, and here at Dale Drills we now produce our own low draught tine assemblies that are specifically suited to the heavier, stonier soils of the United Kingdom and machines with a minimum horsepower requirement as low as 20hp/m. What are the other advantages of direct drilling? 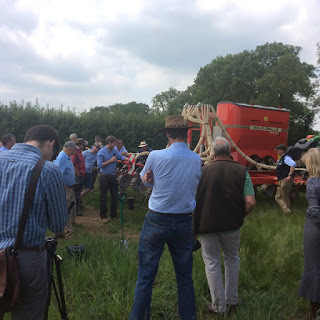 Apart from the obvious savings in fuel costs related to “one pass” establishment, research by organisations like the GWCT has proven that low disturbance farming goes a long way to preserving the natural and healthy structure of our soils, by increasing the biomass content and reducing weather based erosion. Not disturbing the flora and fauna in the ground means the naturally occurring ‘glues’ that bind soil together retain nutrients and promote faster draining of surface water through worm holes and root systems.